New film puts Al Gore's 'climate reality' nonsense about climate and carbon tax into perspective | Watts Up With That? I received a copy of this film by mail, An Inconsistent Truth and despite my misgivings about the name of the production company “Extry Good” and it’s talk-radio pedigree, I’ll have to say its better than many other efforts I’ve seen. It has a number of themes familiar to WUWT readers, such as the Climategate issue, the hypocrisy of Gore, and Mann’s hockey stick nonsense, but misses the mark on the “hide the decline” issue when it talks about scientists hiding declining global temperatures, versus the real issue of hiding the declining tree ring proxy record. Still, compared to some of the blunders Al Gore has made, such as the Earth’s core temperature is “millions of degrees” or the outright lie where he faked a CO2 experiment in post production and refuses to correct it two years later, I’ll give them a pass on this confusing global temps versus the proxy record. After all, Mann himself thinks his hockey stick made from a few tree ring records represents the globe. Some people familiar to WUWT readers such as Dr. John Christy, Dr. Roy Spencer, Dr. Fred Singer, and Steve Milloy (among others) have interviews in it. Al Gore is at it again. In a constant, frantic effort to stay relevant he’s conducting what he calls ‘24 Hours of Reality‘ on the Internet he claims to have created but his 24 hours is anything but reality. Gore starts by saying, “We’re dumping 90 million tons of heat-trapping carbon pollution into the atmosphere every 24 hours.” First of all, the “carbon pollution” Gore refers to is carbon dioxide. It’s what we exhale with every breath. It’s what plants take in as food and it most certainly is not a pollutant. Using the word “dumping” evokes a visual of some huge carbon trash truck backing up to the atmosphere and carelessly dumping its load. What, in fact, is happening is humans and other animals are actually breathing, much to the chagrin of Gore. Automobiles, that used to actually pollute much more than they do today, now have catalytic converters that convert the nasty, real pollution into carbon dioxide which is actually beneficial to the planet. In fact, scientists tell me if you want a perfectly functioning internal combustion engine all you’ll get as a byproduct is carbon dioxide. In other words, it’s been the goal of an entire industry for decades. Gore has also now coined a new term: dirty weather. From the guy who brought you “carbon pollution” comes a new phrase designed to scare you out of your money. Gore’s “dirty weather” refers to so-called extreme weather, which Gore claims is getting more extreme. The truth is extreme weather is getting less so. Gore’s claims of more hurricanes, more tornadoes, more floods and more droughts have all been proven wrong. In fact, most everything Gore has predicted around the hysteria of climate change has ended up being a lie. Gore continues to stick to his claim that carbon dioxide emissions are warming the planet when every scientist in the world now acknowledges that global temperatures have not risen in more than a decade. Gore and others can try to explain it away but the stubborn fact remains. We have not warmed in 15 or so years and many scientists predict that we may actually be entering a cooling phase. All of the climate models that Gore and other climate alarmists have been pointing to all these years have been wrong. Gore also continues to try to scare people about sea levels. He claims cataclysmic rises in sea levels when none of it is true. Everyone needs to watch this report on sea levels from Tom Harris of the International Climate Science Coalition. All of these claims of rising sea levels have been totally debunked yet Gore continues to fear-monger. Why? I’m going to tell you something very few are willing to tell you. 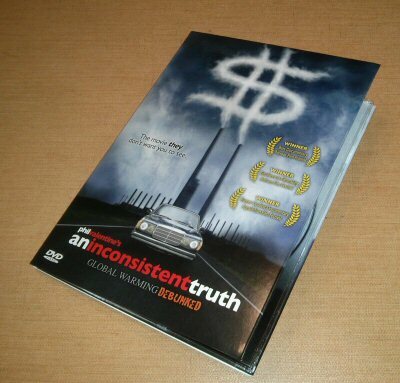 Al Gore is a con man. I know that’s not politically correct and it’s something more polite commentators try to avoid but we can avoid it no longer. When your principal residence is a 10,000-square-foot mansion that uses 10 times the power of the average American home even after you’ve supposedly “greened” it, you’re a hypocrite. When you own multiple other homes, a humongous house boat and fly around the world in private jets you are not green, no matter how much you pay in silly “carbon offsets.” Gore is not some miserly power-pincher who recycles dental floss and sacrifices his life for the cause. His carbon footprint is on par with the Queen of England yet he lectures us and scolds us about our own power consumption. The fact of the matter is Al Gore is neck deep in so-called green investments that stand to make him hundreds of millions of dollars. Much of it is subsidized by the U.S. government and a sizable chunk has already gone down the drain. We chronicle this in our movie, An Inconsistent Truth. The only green Al Gore is concerned about is the green in his pocket and he’s making more of it at your expense. He admonishes anyone who dares challenge him as being in the hip pocket of Big Oil yet he just made $70 million by selling his TV network to one of the largest oil-producing countries on the planet, Qatar, which owns Al Jazeera. The world is spending $1 billion a day on global warming according to the Climate Policy Initiative and that’s about half what they think we should be spending. It is a colossal waste of resources that could be spent on combatting real problems like smog and water pollution. Instead, Al Gore and others continue to spread the terror of climate change in an effort to line their own pockets. It’s disgraceful. 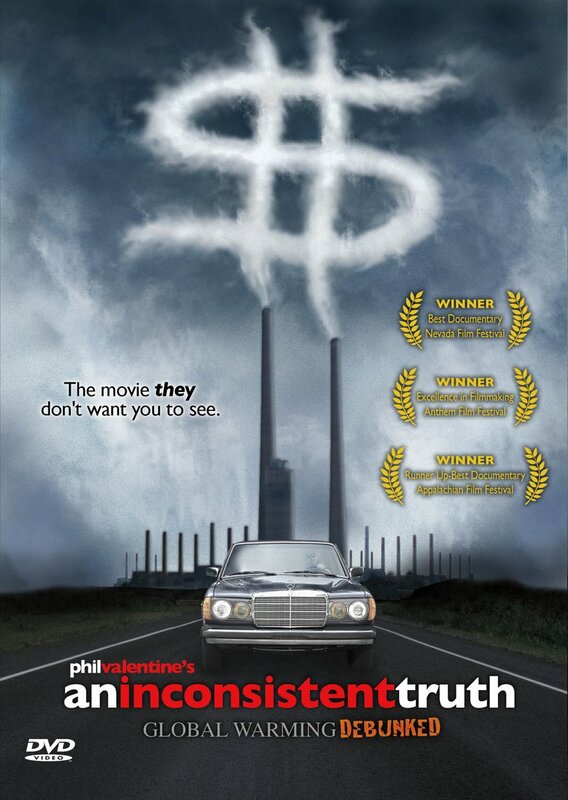 Phil Valentine is the producer of the Amazon.com best-selling documentary, An Inconsistent Truth, the definitive answer to Al Gore’s movie. Winner of three film festival awards including Best Documentary at the Nevada Film Festival. At $20, a pretty good deal, and if you go to a reasonably priced restaurant and get take out, you can have dinner and a show for just $35 more. Temperature record keepers do hide the decline after a fashion, by “adjusting” recent figures up & older data down. But dealing with that real issue separately from confusing that practice with “Mike’s Nature trick” would have been better, of course. The producers should have sent you a preview copy for review. A major asteroid strike would be guaranteed far more devastating, and is moreover guaranteed to occur (at some point in the future) unless we can nudge the offending body a bit. even worse it was his company he bough them from , so he kept the money in house and may have got a ‘tax break ‘ for doing so. A liar he may be , but no fool he. They miss the mark on “hide the decline”. SIGH. Well they are idiots, then. Well intentioned. OUR idiots. But still idiots. It is so important to get these things right. 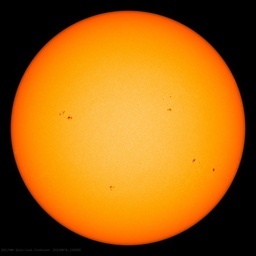 Look at what a couple of silly errors did to “The Great Global Warming Swindle”. There really is NO excuse. It’s a great shame about the obvious blooper concerning what exactly Hide the Decline was all about. There is simply no excuse for this kind of shabby research and means that even if everything else in the DVD is factually sound, that one blatant schoolboy error will make it an object of ridicule and a straw dog to be used against scepticism in general. Looks like me and Jack posted at almost the same time. Great minds, and all that. I always wondered why some alarmist seek to dismiss the MWP and LIA as being regional, yet contend that a single tree is indicative of the hockey stick. But I guess logic is not their strong point. It is a shame, since the real hiding makes such a great graphic when you blow up the HS to see the decline hidden behind all the other spaghetti. Anybody, no matter how lacking in science education, can plainly see the blatant fraud & manipulation. No kidding. It took me a while, in my examination of warmist claims, to realize that none of their claims could be true as we are not warming. Thus, nothing we see or experience today can be caused by warming. Dirty weather? Pity, “safe skies” is already taken. I wish he had not invoked the name of Her Majesty Queen Elizabeth II into this. She has no part in the AGW charade. this “error” isn’t exactly factually incorrect. CAGW by CO2 Alarmists have, in fact, been hiding more than one decline. It would have been great if “An Inconsistent Truth” had discussed both declines, if for no other reason than to appease the purists here. It was an exercise in a physics class to evaluate the difficulty of properly and considerately nudging an asteroid, even at some point in the far future. The progressive left whipped US with their precautionary principle some years ago – maybe the Cassini-Huygens RTGs – surely the unintended consequences of messing with a massive asteroid would engage the precautionary principle. Think of them as weapons, big rocks dropped into gravity wells, and kinetic energy weapons. Then design an anti-weapon. It ain’t easy. Looks like fun, from the trailer. I wonder how many classrooms it’ll get into, though. That’s where we need to counter the Goracle and his Globowel Movement. I’ll keep investing in Topher who at least looks serious. Too bad Newt is in this movie, he doesn’t have a lot of credibility on this issue if you ask me. An interesting article. Just one flaw that I hope you can edit out. She’s not the Queen of England. She’s the queen of the United Kingdom. Pop-up quiz for big Al. Tell Phil that in his Press Release, this sentence: “When your principal residence is a 10,000-square-foot mansion that uses 10 times the power of the average American home even after you’ve supposedly “greened” it,” should say “before you’ve supposedly ‘greened’ it”. ↑Assuming the “you’ve” refers to the average American …. Assuming he’s fixed for life with his half-billion cash stash, I guess he can’t really be described as “desperate”. But he sounds like it. BUNDABERG’S record floods will feature in a climate change documentary, 24 Hours of Reality: The Cost of Carbon which screens online today and tomorrow. Hey, don’t mock “Extry Good” productions. They are Extry Good. That’s Phil Valentine and Co., our local talk radio jock and all around good guy. You know, the more I look at the An Inconsistent Truth website, the more I think we skeptics should get behind this. The Queen isn’t, but Prince Charles is quite the AGW fanatic. “can Al come out to play?” Priceless. The entire Royal family stand to gain from AGW and green power hysteria. Charles, is clearly and blatantly directly linked to green power as much of the installations are on “Royal land”, offshore wind farms for instance. It’s not enough to have their snouts firmly planted in the Civil List (Money given to each family member from the British Govn’t. If memory servers in the mid 1990’s, the Queen received GBP4m p/a, at that time tax free. “Fergie”, received GBP90k), they want a return a “Lord and Master” type society. The Germans and Greeks are doing well out of the British taxpayer! I tried to go to the Faked CO2 Experiment page using the link but it sent me to the Millions of Degrees page instead…. or wasn’t I supposed to check??? like Al Gores’ supporters… or am I missing something….like Al Gores’ supporters…. Is a copy of the film going to be sent to the Nobel Prize committee? Claim: CO2 warms the planet. Evidence: No temp rise in more than a decade (i.e. 17 years). Conclusion: ZERO climate sensitivity to CO2. How does Gore’s blunder here compare with the those of the climate scientists who say the Sun’s temperature is only 6000°C? Gore’s house actually used 20 times the power of the average American house before he greened it so the statement is correct. It now uses 10 times the average American house and got a gold certification from some green entity. This film was not designed to be a “scientist’s documentary.” That’s not where the battle is being fought. The battlefield is public opinion. That’s what sways policy and that’s where we need to concentrate the effort. We have to put the cookies on the low shelf so ordinary people understand they’ve been lied to. be listed on this blog along the right side in the appropriate place. While each joins the “battle” on a different field, both address the overall scientific truth regarding what, if any, effect we humans are having on the climate, and what, if any, action we should take. I believe the actions are to continue to make the planet as pleasant as possible for us, grow food for food, and be diligent stewards of the Earth where warranted.